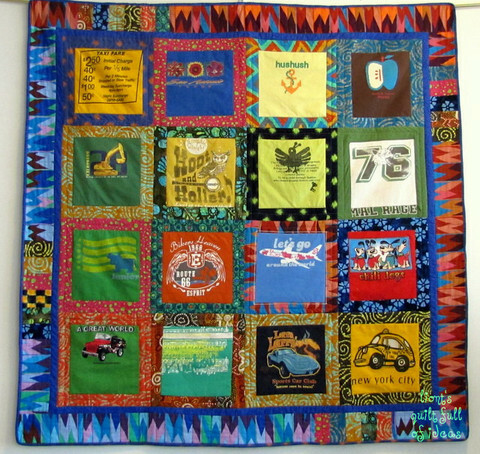 Has anyone made a T-shirt quilt ? 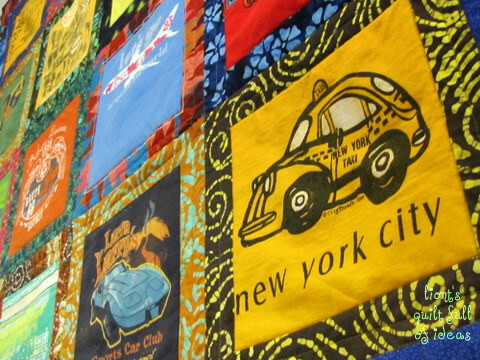 Thread: Has anyone made a T-shirt quilt ? I want to make a T-Shirt quilt but have no idea how to do it. I am looking for any advise. I did this last Christmas, with T shirts my ds2 worn from 3 yo to 7 yo. My son refuses to throw away his worn out shirts (he is a sentimental boy), so I thought a T shirt quilt might do the trick. I did this real fast, not meant to be an heirloom or anything! I squared the centers and added sashing. I tried my best to center, but it is hard for some of them because the smaller sized shirts have the armholes closer together. Also, the knit material is wobbly, so I added a fusible stablizer. Last edited by liont; 05-25-2012 at 02:17 PM. It really isn't hard. Check out u tube first. More than one if you can find and then put on your thinking cap! Missouri Star Quilt Co. has a quick tutorial on you tube that is helpful and then I also bought an Eleanor Burns pattern called T-Shirt Quilt that is very helpful. I'm a pattern sort of person even if I don't follow it exactly, it is very good. It has some unique ideas for using jerseys with buttons and also the smaller t-shirt logos. Just depends the amount of information you like. I'm just finishing one for grandson that includes his pre-high school baseball shirts and jerseys. He will be a junior this fall, so I see another one in the future with his high school shirts. I haven't taken a picture of it yet so can't post one. Hoping to do the quilt "sandwich" step this week-end. I'm really happy with the way it is turning out. liont, I love this quilt ... and sure hope it will be a heirloom after your son grows tired of it! I like the variety of sashings around the t-shirt squares ... and then the borders. What great ideas! That is a great memory quilt for him. use the search here for pictures and you will get lots of ideas. If the portions of the t-shirts that you want to cut out are equal in size, you might want to use the shadowbox pattern on it. I saw one that came out looking so cool. If they differ drastically in size, you may want to use 12.5, 6.5, and 3.5 inch (unfinished block sizes). 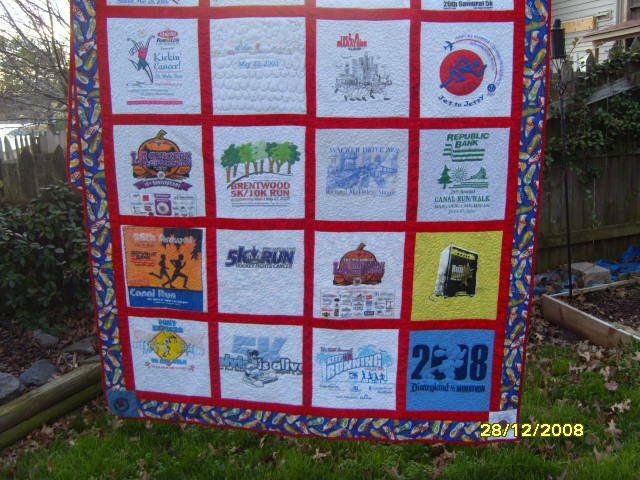 I made a T-shirt quilt several years ago from promotional t-shirts from where I worked. Be sure to use an iron-on stabilizer BEFORE you cut the block because the T-shirt fabric will roll up on you.....bad! French Fusion is a great light weight option. I also used shirt pocket emblems in a 4 patch as well as some elongated images stitched together separated by sashing to make all blocks equal. However, I saw a t-shirt quilt made by putting the images together in a collage effect. It was really cool.....outside the box for sure. Good luck; you will learn a lot as you go. I just finished two t-shirt quilts and found "You Did What With My T-Shirt?" by Judy Bobbit & Katie Reed very helpful. Ditto on the stabilizer...it's a MUST. Thank you all for the good advise ! I feel better about starting this project. I made one for my daughter-in-law of her shirts from running in races. The border was of fabric with colorful tennis shoes. It was great fun. Each block was FMQed according to the design.